ADRIAN PRATT was a former member of PEGASUS and also founder-member of HITLERZ UNDERPANTZ – both pre-OMD bands that Andy and/or Paul were involved with. 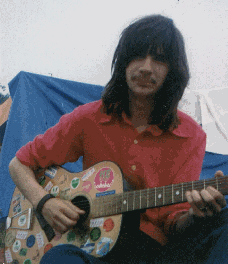 Adrian was also involved in other Liverpool bands such as Mr Grumbold before developing an interest in religion, which led to involvement with a lot of gospel rock bands. Adrian has since left Liverpool and relocated to the US where he works as pastor for a Presbyterian Church in Long Island, NY. Can you explain how Hitlerz Underpantz came about? There was a guy called John Rodgers (whom a lot of us knew as ‘Toad’), who lived in Wallasey, just across the waters from Liverpool. Himself and I used to hang out a lot together. For some bizarre reason his mum sent him to a school in the town where I lived (Moreton), whilst I was sent to school in Wallasey… something to do with getting free bus passes! We both didn’t exactly enjoy our high school days and spent a lot of time pretending we were in school when actually we were playing hooky. (Shhh. Don’t tell anyone). Toad’s brother, Alvin, was quite a bit older than him and had accumulated a stack of weird and wonderful Hi-Fi Gear.. including Tape Decks that went at different speeds and quasi-quadraphonic amps. Alvin not being home a lot, we used to play around with all that good stuff. Toad (and to a lesser extent myself) also applied ourselves to making home-made tone generators, which we’d play very loudly through the aforementioned Hi-Fi stuff… fool around mixing in bits off the radio, doing strange things to the piano or whatever else we could get our hands on. I remember one afternoon just walking around the town with a little cassette player, recording sounds, traffic, wind, people’s conversations at bus stops… and then mixing it all up on the big tape. We’d fool around with the speeds, play the tapes backwards and bounce the sounds around from tape head to tape head creating weird echoing noises. There was all this music around at the time, mostly available from what was then Virgin Records’ little shop over in Liverpool, by German groups like Can and Faust.. and gigs going on at the “Stadium” in Liverpool, by groups such as Gong and Henry Cow. We spent a lot of time trying to sneak into the concerts and very occasionally got back stage to meet folk like Captain Beefheart. We also had friends in school who were into the avant-garde classical stuff: Stockhausen, The Madness Of King George, and I guess we were also listening to the likes of the rock/jazz groups like Soft Machine, who could get pretty darn weird at times. Unconsciously we were soaking up the idea that if something made a noise, it was worth recording and fooling with. So we had all these odd sounds on tape, and after a few too many beers, with the lights way down low, it sounded.. well… hard to describe. It’s a shame that all those tapes are long gone and forgotten. Or maybe not! Eventually we mooted the idea of doing a live performance somewhere. By this time I was already playing in a couple of bands, one of them being Pegasus, which Andy would later join. More importantly I had purchased this strange machine called a Roland SH1000 synthesiser… a strange beast which couldn’t make up it’s mind whether it was a home organ add-on or a Moog wannabe. (There’s a page on my website all about it!). One night we were sitting around trying to come up with the stupidest name we could think of… and from somewhere came Hitlerz Underpantz. First recruit for the band was Chris Fagin. Chris was heavily into German Avant Garde, had a dad who was a printer (which could provide that wonderful thing called publicity), a drum kit and a whole host of other gadgets like movie cameras and lights and disco stuff. Chris also had as warped a sense of mind as Toad and myself, so it was a logical matching. He wrote a lot of lyrics for other folk to put music to… I recall one he titled I murdered the Fruit Salad and even hosted parties from time to time… what better qualifications for a band member? Next came Simon Catteral. Simon was an incredibly amicable, laid back guitarist who had the ability to jam along with what ever the noise was in the background. Not only that but his mum let us practice in his garage. That was it. He was in the band. So in November of 1975 Hitlerz Underpantz went live. And I’m pretty sure Andy was there. What were Andy and Paul like in those early days? I’m saying I’m pretty sure Andy was there, because he was always incredibly supportive of the local music scene. Before he joined Pegasus or Hitlerz Underpantz, he was a great punter. Along with one of his friends, Duncan Lewis, they had a knack for organising gigs and getting their local peers to support them. I remember Andy coming along sometimes in the strangest outfits.. People like that made it fun…I think I can say that for many of us back then..the idea that we were breaking new musical frontiers or doing something radical would be irrelevant. Hey – we were young, we were having a great time, and things like college and “Work” were threatening on the horizon (not that there was much work around Merseyside in those days). A lot of us didn’t have much cash.. there was a lot of borrowing each others gear and helping each other out. I remember playing the keyboard that makes those melody notes on Electricity… nothing quite like it.. kind of an electric xylophone with attitude, but NO sustain. Likewise there was a, “Chroma” keyboard (or something like that) that had incredible sustaining patches on it when you used the footpedal. Made the gigs that extra bit exciting when you didn’t actually know what instruments you’d have to play with. All depended on who turned up! I know Andy used my Roland SH1000 for a while, but luckily, whilst it may have given him a taste for synthesisers, he had the sense to try some other brands. It really was kind of limited! (And almost impossible to tune). Paul I really didn’t know as he came on the scene just as I was kind of moving out of the scene, so to speak. However, I did once help move a piano to his house on a hot sticky day. I remember it well, because I left the windows of the van open.. and it rained and rained whilst we were in the house, in a typically British way.. leaving my front seats dripping wet for days. My girlfriend (joint owner of said van) was not amused. But she married me anyway. Andy and Paul started getting involved in Hitlerz Underpantz at the same time I was un-involving myself with them. We had a common interest.. they loved fooling around with tapes.. and synthesisers and all that other evolving stuff. We’d met at gigs and things. I’d left Pegasus around the same time and Andy had become their singer – so although we had a common background of interests – we were actually heading in different directions. But I think it worked out pretty well with them and Toad and Chris Fagin. Can you recall what the Hitlerz Underpantz gig with Paul and Andy was like? You know I really can’t. I was just getting into this heavy ‘evangelical religious’ phase, which was one of the reasons I was dropping out of all these bands I was playing in and trying to get into doing gospel rock stuff. Looking back I regret the way I isolated myself from people who had been good friends for a long time and really didn’t handle myself at all well at that time. Arrogant. Self Righteous. Yep.. I guess I took on all of those good religious virtues that religion can sometimes produce. I took some bad advice from severely intolerant religious folk and probably lost a lot of friends in the process. So I never actually did a live gig with them. I remember going to a few practices, but my head was somewhere else and my heart wasn’t really in it. If I’d paid a bit less attention to myself, I might have learnt something! Because I do know that they took things to a next level. Something like actual songs and tunes started to emerge. That was primarily Andy and Paul’s influence. They were quite into groups like Kraftwerk.. who were a lot more melodic than the Fausts and Tangerine Dreams. They even had girlie singers on stage (The Brazen Hussies I think they were called) and I know their gigs were a lot of fun. Shame I wasn’t of a mind to appreciate all that was going on back then. These days I still have strong religious beliefs, but thank the Lord I think I’ve lost that blind dogmatism that religious experience sometimes mistakes for spiritual growth! We live. We learn. And we may well change certain things if we could. Whilst I wouldn’t change my core beliefs, I would change the way I’ve handled them! There were a lot of other local bands that you were part of at the time, was there ever a possibility of you being part of The Id? Now there’s a question. I’m not sure I was ever in a position to be asked or to consider it. Like I say I was going through this religious thing. Yet, in another way, I know they adapted a few songs from Hitlerz Underpantz Days that I’d composed (like a thing called How Unfortunate To Have A Name Like Nigel and The Riff) so maybe, in a very small way I was a little part of them. And there are little passages, even amongst the O.M.D. material, that sound like vague echoes of some of that early Pegasus stuff. I was certainly a little part of the musical scene that nurtured them. And sometimes we would cross paths. At a later date the ex-girlfriend of OMD’S drummer became girlfriend for a while of the drummer in a group called Bananas that I was part of, so you used to see people from the different groups around the place. And one time I put in a guest appearance with a band called Jasper who were playing as a support band to The Id. But being part of The Id? I guess it was possible. Anything’s possible. But the way I was back then… not probable. Are there any OMD songs that stand out as favourites? There are a number of things that I really like about OMD. One is the way they capture images and pictures that I grew up with. Stanlow, a certain phone box outside the Railway Inn and of course Electricity because it’s got that weird piano/xylophone keyboard on it playing the melody. I think Enola Gay is a classic. Just the whole way it’s put together – simple but so effective. Loved it when I first heard it and still love it. Dazzle Ships always struck me as an album in a true Hitlerz Underpantz tradition. Tracks like ABC and Time Zones are both quirky and inventive. Some of the later stuff, Milky Way era, is pure, unadulterated pop, but retaining that “OMD” something. I guess what I really like about them is that they made it big.. made a career out of all that fun and creative anarchy that was a part of where I’m from. Hey, you’re 15 years old, goofing off, playing in bands, playing with sounds, going to parties…. yeah, it’d be nice if it could last ever. Every time I hear an OMD song, I’m reminded that a couple of folk I grew up around managed to take that madness and do something incredibly inventive with it. In a funny sort of way I’m proud of them. Maybe I’m even a little bit jealous – but “all in the best possible taste” (as British comic Kenny Everett would say). I think everybody who grew up in that music scene had at least a little dream of taking things further and doing something more. With a lot of creativity – maybe a few lucky breaks – a good deal of hard graft – and a bucket load of charisma – Andy and Paul pulled it off. Me? Well my life took a different course – and I seriously have no regrets that it did. What I know about today’s music could probably be written on the back of a postage stamp. But the strange thing is, whatever I’m doing, music always seems to end up as part of it! It’s a gift you never lose. A bit like that melody in Joan of Arc……. This interview originally appeared on the Official OMD Website on 22nd June 2001.